Today the Suez Canal remains the traditional sea route where cargoes transported between the Far East and Europe, and vice versa. However, the most important international waterway is the Straits of Malacca situated in the Southeast Asian region where it is estimated more than 80,000 vessels are plying through the straits annually. There was recently an interest to venture into a new route namely the Northern Sea Route (NSR) as an alternative route between Europe, and the Far East and vice versa. This paper aims to explain the background of the international trade and shipping at the Straits of Malacca. Secondly, to explain the importance of the NSR in facilitates commercial shipping and trade in the Artic Region. Thirdly, to analyses the NSR’s commercial potential and economic importance as an alternative route for commercial shipping and trade with Asian Region and finally to analyses the challenges and constraints of the NSR including the physical aspects of the route which is in ice conditions most of the time around a year. 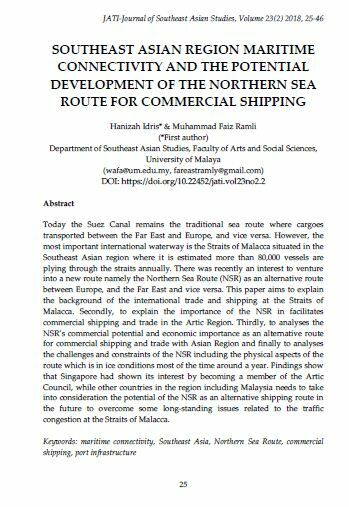 Findings show that Singapore had shown its interest by becoming a member of the Artic Council, while other countries in the region including Malaysia needs to take into consideration the potential of the NSR as an alternative shipping route in the future to overcome some long-standing issues related to the traffic congestion at the Straits of Malacca. IDRIS, Hanizah; RAMLI, Muhammad Faiz. SOUTHEAST ASIAN REGION MARITIME CONNECTIVITY AND THE POTENTIAL DEVELOPMENT OF THE NORTHERN SEA ROUTE FOR COMMERCIAL SHIPPING. JATI - JOURNAL OF SOUTHEAST ASIAN STUDIES, [S.l. ], v. 23, n. 2, p. 25-46, dec. 2018. ISSN 2600-8653. Available at: <https://jati.um.edu.my/article/view/15411>. Date accessed: 26 apr. 2019. doi: https://doi.org/10.22452/jati.vol23no2.2.